The cast of “Tiger Cubs 2” share about the new drama. 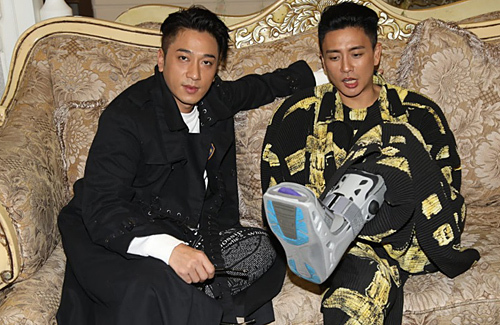 Bosco Wong (黃宗澤) and Ron Ng (吳卓羲) denied rumors about good friend Raymond Lam (林峯) announcing his marriage during a meal gathering, but did not forget to crack jokes, with Ron volunteering to be page boy and Bosco offering himself as the “wedding car driver” should wedding bells be ringing for Raymond. Making their appearance at the celebration dinner of Shaw Brothers web drama Tiger Cubs 2 <飛虎之雷霆極戰>were Michael Miu (苗僑偉), Joe Ma (馬德鐘), Christine Kuo (苟芸慧), Eva Lai (黎燕珊), and Zoie Tam (谭凯琪). Bosco, who suffered a leg injury, appeared with crutches and revealed that he will need the help of a body double during one day of important filming. The actor also joked that it is not as easy as one imagines to sit on a wheelchair and act out walking or even fighting scenes. When asked if he wants to be a best man for his good friend, Ron answered that he prefers to be a page boy. He added that while he has seen Raymond’s girlfriend Carina Zhang (張馨月) before, he will leave it to Raymond to elaborate more on the relationship. Sharing plans for the upcoming Lunar New Year, Ron revealed that he would be flying to Canada for a performance with Elaine Yiu (姚子羚) on the first day of the new year and would most likely be delivering festive songs. As for Bosco, he humorously joked about wanting to be the “wedding car driver” should Raymond get married. During the new year, he has arranged a session with his occupational therapist. When asked if he would like to be part of Flying Tigers 3, Joe Ma, who had been a part of the Hong Kong Police G4 unit, answered that he wants to take on an antagonist role as it would be “much more fun”.